Welcome to the Neighborhood (Luke 10:29-37) | Joe Quatrone, Jr.
Posted on August 20, 2013	by Pastor Joe Quatrone, Jr.
With a plain red sweater, white canvass sneakers, a warm smile, and a simple song Fred Rogers became a PBS legend. He recently passed away, but his work still lives on because he did his best to be the kind of person that every child would want for their neighbor. Does anyone know the name of TV show I’m referring to? This morning I want to look at a familiar story in the Bible, which asks a similar question about being a neighbor. It is perhaps the most well-known parable in the Bible. It’s definitely one of my favorites! It is found in Luke 10:29-37 and is the parable of the Good Samaritan. His question, however, is not sincere. Remember, he is only trying to test Jesus. In his mind, he already knows the answer. He is a Jew, and Jews thought that they could inherit eternal life by simply being a Jew (God’s chosen people). That’s like saying you’re a Christian because you were born in America or born into a Christian home. But Jesus does not answer his question. Instead, He asks the lawyer what the law said about the great commandment: “What is written in the law?” Jesus asks. Jesus was giving the lawyer the opportunity to answer his own question about inheriting eternal life. From this passage, we learn that both God and humans are to receive love. Such love is not marked by the presence of great feeling, but is objectively manifested in compassion and other outward signs of loving acts and considerate responses. In other words, to love and be devoted to God is expressed by love and devotion to others. There is no distinction between love for God and treatment of people. They go together. Jesus wants total love for both God and humankind. This is a summary of the Law of Moses. In verse 28, Jesus affirms the lawyer for knowing he is to love God and his fellow man. But just having knowledge of what God requires him to do is not enough. Such knowledge needs to be put into practice. The lawyer had no problem with God; he had studied God in the Old Testament. He thought he knew all about God, but he hadn’t applied this knowledge to his life. In verse 29, the lawyer wants to clarify who a neighbor is and how extensive the demand is that he loves his neighbor. He has trouble with the idea of being a “neighbor.” He is trying to separate his relationship with God from his relationship with his fellow man. He is so heavenly minded that he is of no earthly good. He wants to know who he has to love and who he does not have to love. But the important question is not “who is my neighbor,” but “To whom can I be a neighbor?” This is what Jesus is focusing on. Loving both God and people is a summary description of what believers are to do (1 Corinthians 2:9; James 1:12, 2:5). Anyone who truly loves God will respond to His message and, as a result, to his fellow humans. But the lawyer fails to see this! It is clear that he is not anxious to correct his past neglect; all he wants to do is to justify himself. He is seeking a clarification from Jesus that will allow him to feel confident and comfortable about not loving certain people. The implication is clear that he wishs to soften Jesus’ command to love his neighbor as himself. He does not want to feel a sense of obligation to respond to the needs of others. It is here that Jesus turns the discussion with the lawyer into a confrontation. The lawyer is looking for the minimum obedience required, but Jesus requires total obedience. That the lawyer seeks the minimum shows that something is wrong: he is approaching God on human terms and not on God’s. The parable leaves no doubt that the lawyer is challenged by Jesus’ command to love his neighbor. This reminds me of Hitler and the holocaust. Hitler did not consider the Jews to be real people. To him, they were a subspecies. They had no value and were not worthy of his love, which is why he led an army of Germans to annihilate them. But Jesus refuses to allow this limitation. He rejects all attempts to shrink the scope of human responsibility and love for our fellow man. He refuses to turn people into things that can be ignored. So he basically tells the lawyer, “Do not worry about spotting God’s people, just be a neighbor to everyone.” The scope of the command to love and be a neighbor is far greater than the lawyer had anticipated. In verses 30-35, Jesus tells a story about a man who falls prey to robbers. The victim is only minimally described, since he is not the focus, those who react to him are. He is traveling from Jerusalem to Jericho. The journey had a reputation for being very dangerous. It went from almost 2,600 feet above sea level to 825 feet below sea level and was about 17 miles in length. It was rocky, went through the desert, and was surrounded by caves, which made good hideouts for robbers who waited to attack people and exploit travelers on this road. It’s easy to point our finger at the terrible thieves, but we need to look a little deeper… within ourselves. Maybe, we haven’t physically attacked anybody, but we usually attack people with our lashing tongue. Our tongue is a deadly weapon. It can kill our testimony or the reputation of another. Your tongue can strip a person of their joy, hope, and love. There’s a phrase, “Sticks and stones can break my bones, but names will never hurt me.” Not true! When we let the devil have control of our tongue, it becomes a deadly weapon, leaving people half-dead, just like this man was, unable to continue on their journey. Sometimes, we wound others passively instead of actively by neglect, the failure to speak. We refuse to listen, witness, encourage, teach, uplift. In so doing, we wound our neighbors. There are people all around us who are wounded and in need of a neighbor. Perhaps there are some here this morning – wounded, miserable, hurting, in pain. They feel like life has thrown them on their back and is kicking them while they are down. They are wounded (1) in body – their health has turned to sickness; (2) in self respect – they are defeated or humiliated; (3) in affections – they are lonely, experiencing grief, or animosity; (4) spiritually – they have lost the joy of their salvation, or have fallen into sin; (5) financially – their world is falling apart around them. Before we can ever be a neighbor to someone, we need to see who is in need of a neighbor. This man who was attacked by robbers was in need of a neighbor. So what is the reaction to this tragic scene? Who will respond to the man in dire need? In verse 31, we’re told the first man with an opportunity to help is a priest. He was coming down the road “by chance.” This appears to be optimistic; help is around the corner. Having a priest on the road would not be surprising, since many priests lived in this region. Here is God’s servant who ministers in the temple and represents the height of piety. But when the priest sees the man, he passes by on the other side of the road and provides no help to him. Many motives have been suggested for the priest’s refusal to help: fear of becoming unclean from touching a corpse; hesitation to help someone who may be a sinner; fear of being robbed while giving aid. However, none of those motives are legitimate nor is Jesus concerned with the excuse. The point is the priest gave no help. Can we identify with the priest who was too busy, too concerned about his own life, too tired from a long day’s work, and too selfish to love his neighbor? In verse 32, a second religious leader comes down the road, but he too passes on the other side and offers no help to the man in need. He was a Levite: a member of the tribe of Levi. He was responsible for the less important tasks at the temple and could be thought of as a priest’s assistant. The Greek wording suggests that he took a closer look at the injured man and the place where he lay, but he still walked away. Whereas the Priest didn’t even get close, the Levite is curious; he wants to know what is wrong. He was very willing. The problem is we have a lot of willing people in the church – willing to let somebody else do it! It’s easier to do nothing. In verse 33, everything changes as a third man, a Samaritan, arrives on the scene. For a Jew, a Samaritan was among the least respected of people. Eating with Samaritans was equated with eating pork. Such people were unclean and to be avoided. Jews and Samaritans hated each other. This would be like a Cuban refugee finding Castro beside the road or like an Indian finding a cowboy beside the road. The Samaritan would be the last type of person the lawyer would expect to help the man and resolve the crisis. This twist in the story is key, for it is a despised Samaritan, who loves the man, outshining the exemplary pious Jews with his sensitive response. It is he who shows compassion to the half-dead man, not them. This is the essence of being a neighbor: having the sensitivity to see a need and then do something to meet that need. The account focuses on the Samaritan’s activity as a neighbor. While the others scurried past, the Samaritan lingered over the one who needed help. By choosing the Samaritan as the model, Jesus shows that neighbors may be found anywhere, among any racial group, even in those groups despised by the Jewish leadership. In verses 33 and 34, Jesus describes several concrete compassionate actions the Samaritan undertakes for this man: He (1) comes up to him and (2) binds his wounds. This might have involved the Samaritan’s ripping up some of his own clothes for bandages. As he engages in the process of bandaging the wounds he (3) anoints the cuts with oil and wine. Oil soothed the wound, while wine disinfected it. The Samaritan may have even deprived himself of refreshment in the midst of his journey to care for the man. He (4) loads the man on his own mule, which probably meant the Samaritan walked from here on. He (5) takes him to an inn, where he (6) can provide further care and comfort to the man he has just met. He does not dump the body and run, but stays the night to care for him. As a neighbor, he does everything he can to love the man. In verse 35, the Samaritan insures the continued care of the man by laying out two days’ wages and offering to pay additional expenses. The innkeeper is to look after the man until the Samaritan returns. It is clear the Samaritan intends to pay the entire bill. The sense is, “I will repay, not the man.” The Samaritan has taken care of the problem, as well as helping with the man’s physical wounds. This compassionate act, as many compassionate acts do, involved a concrete price that the Samaritan was willing to pay. Compassion is more than just pity. It is an inner stirring; a deeply motivated, unnatural love. The Samaritan saw a need and did something to meet that need. Love does not look at obstacles; it looks at opportunities. A neighbor is anyone we see, whose need we are in a position to meet. But the lawyer was only willing to talk about who his neighbor was. He was not willing to do anything. One of the best ways to get nothing done in the church is to just talk about it, but not actually do it. A ministry that costs nothing accomplishes nothing. Are we willing to be inconvenienced in order to show the love of Christ to our neighbors? In verse 36, Jesus asks the lawyer’s opinion about which character acted as a neighbor to the injured man. The lawyer gives the obvious answer, though he cannot bring himself to say the word, “Samaritan.” Instead, he focuses on the showing of mercy, which was the key to the Samaritan’s exemplary action. Although the lawyer has seen the point of the story, he has yet to break through his prejudice. So in verse 37, Jesus calls him to respond. He tells the lawyer to, “Go and do likewise.” The lawyer is to emulate the Samaritan. The lawyer is to be a neighbor to anyone he sees—like the Samaritan was. The question becomes does he love God enough to respond to needs of hurting people? Does he love people enough to be a neighbor to them regardless of their background? What about you? This parable is a significant passage about a disciple’s ethics. It shows what kind of action God require of us. Love for God expresses itself in love for people and sensitivity to the needs of others. If we truly love God, our love for Him will be manifested in outward actions of love and compassion toward others. Compassion, response, and love is what makes a good neighbor. 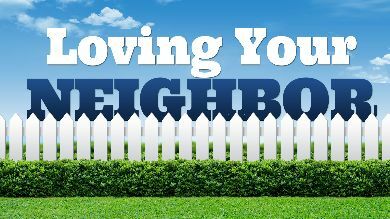 Neighborliness is not found in a racial bond, nationality, color, gender, proximity, or by living in a certain neighborhood. We become a neighbor by responding in love to the needs of others. If we seek to restrict those we serve, we are not truly loving God and being a neighbor to all people. The issue is not to seek to identify which people are worthy of our love, but to love and serve anyone where a need exists. We should not to seek to limit who our neighbors might be. Rather, we are to be a neighbor to anyone whose need we can meet. A lack of love for our neighbor reflects a lack of love for God. Jesus used this story of the good, but despised Samaritan to make clear what attitude was acceptable to Him. All people are to be loved and treated fairly. Anything less is unacceptable. This parable is a call to be a neighbor to everyone, showing compassion to anyone who is in need. Being a neighbor does not make distinctions in offering care. At the heart of believing in God is loving both Him and other people. Such was the example of the Samaritan, who not only soothed the beaten man’s wounds, but also took him to a place of shelter, cared for him, and made sure his needs were met. The Samaritan cared for a person he had never seen before, a total stranger. Without asking questions, he served a cup of mercy to a person half-dead. By reviving life, he showed life. This entry was posted in Book of Luke and tagged Bible, Christian, Compassion, God, Jesus, Love, Neighbor, People, Servant. Bookmark the permalink. Thank you for challenging me to love through fellowship and all those whom God puts in front of me. We can have all the knowledge of God that there is and if we don’t love it is useless. In my rougher days I lived in a trailer court that was fraught with poverty, violence, drugs, crazy lives… need. I found, however, that because all of us were ‘needy’ there, we shared and helped one another on a regular basis… hey, I can’t pay my electric bill, can you cover it for me?… Dad is drunk, can I stay here for the night?… Joe doesn’t get paid until Friday, you got some milk we can use? Though our lives were certainly ‘ungodly’ in many ways, we seemed to have mastered the idea of loving our neighbors. On the other hand, after I got saved, the Lord cleaned me up and eventually relocated me to a ‘good’ neighborhood. Funny thing, while we are all more ‘godly’ round here, nobody shares or helps each other. For one, people are barely home… and when they are, they just want to relax and keep to themselves. I’ve brought produce to the neighbors (I have a great garden! ), delivered cookies for holidays, passed out invitations for church events and evangelism brochures and repeatedly offer myself if anybody ever needs anything. But nobody has ever asked for help or displayed the slightest indication that they have any need. Once my car wouldn’t start and I asked a neighbor who has a shop and tinkers with refurbishing fancy old sports cars if he’d come take a look. He said he doesn’t do work for people in the neighborhood because then everybody would be asking… and they are Christians! While it’s more peaceful here, it’s also more sterile and lonely. My thought is that the neighborly attitude is lacking because people don’t feel they have need and consider it humiliating to suggest that they do. I’m wondering if maybe some Christians help others primarily because it makes them feel more important and worthy, better than. Maybe a little humility and recognition that we are all ‘needy’ would free us to be a little more neighborly. Wow!! Well said!! I have been thinking about this lately. Amen!! This is a great comment. Thanks for sharing. It’s sad how we Christians can be loveless at times. God bless! The scandal of making a Samaritan the hero is the part of the parable that stays with me the longest. So I like to imagine Jesus telling a version of the story today. Who would take the place of the Samaritan? In other words, who are our Samaritans? Thus, for me, the parable strikes home, prompting me to examine myself spiritually. That is a great way to let Gods Word heal you by an object lesson from the Bible applied to your actual life! Very well done! Thank you for challenging me to do the same. Last week I spent 2 1/2 hours speaking to a new member of my congregation. She brought up the question of how to know when one is listening to God and when one is having an internal dialogue. I agreed that this can prove difficult at times, but that if that voice agrees with one, it is not God. That is an attitude I apply when considering scripture. I study it carefully, being aware that my preconceptions might be wrong. So I might misinterpret it while trying not to do that. And sometimes the surprises are simultaneously surprising and uncomfortable. The purpose of the Gospel, I heard once, is to comfort the afflicted and to afflict the comfortable. It has–and does–afflict me–as it should. Amen!! I’d say I’ve experienced it both ways in different portions of my life. How very True your words…”Compassion is more than just pity. It is an inner stirring; a deeply motivated, unnatural Love. The Samaritan saw a need and did something to meet that need. Love does not look at obstacles; it looks at opportunities “…. These are words of genuine Love and Power, Thank you Pastor Joe for sharing them, I have taken them to heart, I have a very important decision to make. I was once told that it was ok not to like someone as long as we love them, but Agape Love that you shared about is Spirit filled and lead, and so it also has Phileo Love which is friendship and Eros Love, emotional or physical intimacy. It is ok to hate the wrong that people do and say, we don’t have to accept it, meaning those things God calls evil, not just by what we think is not acceptable and when we correct them in Love it is not cruel and vindictive but nor is it saccharin sweet love, which means it may need to be very firm at times, as we see with Jesus, John, Paul and others in Scripture. We also don’t accept false teaching as ok, we reject it firmly with the confirmation of Scripture when needed but yes Pastor Joe as you said, we do accept all people as people of worth Jesus died for them, regardless of where they come from and what they do and say, who are we too belittle anyone by our contempt even if passive, what makes us think we are a better person than them, we too have sinned and needed sacrificial forgiveness… have we walked in their shoes, felt their pain, been abused or abandoned by those they Loved etc…. Jesus calls us friends. We were created to Love 100% evil is the lack of Love… God’s Love is not the fleshy type that has no commitment, selfish and egotistical, God’s Love is very Passionate and feels and shows emotion, Jesus cried, He yelled, He got the whip out He was tender and forgiving but regardless of what people did to Him or said to Him or about Him behind his back, He knew who He was and did not accept their abuse into His heart, He forgave them, evil actions and words only hurt us, meaning eternally when we do accept them, because they lead to bitterness and resentment and so give Satan a foothold which leads us into sin. Jesus continued to Love passionately and felt compassion for those who abused him in words and deeds, He was known as a man of sorrow and acquainted with grief, yes He knew were they would go if they did not repent and it hurt Him greatly, He Loved them so much and so He died a cruel death for them, so they wouldn’t go to Hell if they did repent and He did this for us too. As you shared Pastor Joe, what we do to others we are doing to Jesus, we either bandage His wounds and provide for His needs or we walk on the other side of the road and sometimes we can even spit at Him and ignore Him…. Amazing Love how sweet the sound! Hi again Pastor Joe, one of my insightful Spam messages said that my wordage or something like that was not long enough, after I stopped laughing, I thought perhaps I should check with others they might be right, so if you agree with my Spam, I will add more detail to my comments for you.